Defending champions Mid were the sole winners in the opening round of matches in the Fife & Lothians Winter League at Longniddry. As hosts East and Fife fought out a 2-2 draw, Mid got their title defence off to a flying start with a 3-1 victory over West. The top two games in that match could have gone either way before both ended up all square. Kieran Cantley, playing with David Miller, holed a 12-foot birdie putt at the 11th to put Mid ahead in the top match. But, after squaring matters at the 15th then halving the 16th in birdie-2s, Ross Callan and Simon Lockhart had chances at both the 17th and 18th to win that encounter. 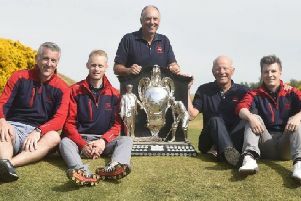 The second match was also tight all the way, with Rory Smith holing six-foot birdie putt at the last in the company of Jordyn Rhind to deny Sean Marc and Jamie McIntosh. Mid then edged ahead when debutant Andrew Wi joined forces with Dougie Waugh to record a 2&1 win over Michael Wilson and Barrie Lewis. The bottom match involved Stephen Gallacher’s 16-year-old son Jack, who teamed up with Ross Mallon against a tried-and-tested Mid pairing in Scott Walker and Conor O’Toole. The Mid due were two up through 11 only to be square standing on the 15th tee, with Walker requiring to hole an eight-footer at the last to secure a one-hole win. “We are happy to get off to a winning start against a strong West side and are now looking forward to the game against East this Sunday at Thornton,” said Mid’s Alastair Dun. East’s opening draw was largely down to the efforts of a trio of Longniddry players – Michael Bacigalupo, Nathan Free and Cameron Gallagher. Bacigalupo and Rob Paterson overcome a run of four straight birdies from their opponents, Stevie Aitken and Alex Moir, to record a 2&1 win. And, in the match behind, Free and Gallagher gelled well in beating Sam Nicholson and Ryan Walsh 4&3. But Fife came out in the top and bottom matches, both of which were close encounters that either went to the 17th or 18th holes. “I was pleased with a draw,” said East’s Ian Robertson, a sentiment shared by his Fife counterpart Bill Dickson. “We are still in the hunt for the title and now we are looking forward to playing West at Thornton, hoping home advantage helps our cause,” said Dickson. East 2, Fife 2: R Thompson and M Saunders (both Gullane) lost to F Carr (Crail) and G Wishart (Lundin) 2&1; M Bacigalupo (Longniddry) and R Paterson (Kilspindie) bt S Aitken and A Moir (both Leven Thistle); N Free and C Gallagher (both Longniddry) bt S Nicholson (Lundin) and R Walsh (Kirkcaldy) 4&3; C Johnstone and C Ratcliffe (both Royal Musselburgh) lost to L Duncan (Dunnikier Park) and A Collier (Duke’s) one hole. West 1, Mid 3: R Callan and S Lockhart (Bathgate) halved with D Miller (Duddingston) and K Cantley (Duddingston); J Rhind (Kingsfield) and R Smith (Dalmahoy) halved with S Marc (Broomieknowe) and J McIntosh (Newbattle); M Wilson (Kingsfield) and B Lewis (West Lothian) lost to A Ni (Murrayfield) and D Waugh (Baberton) 2&1; R Mallon (Greenburn) and J Gallacher (Bathgate) lost to S Walker (West Linton) and C O’Toole (Craigmillar Park) one hole.